The 2018 cricket season has been one of positive cricket and glorious weather. If you also judge the term by how many games you win, then it has been a successful season all round. After an early start to the term and three weeks of rain, the sun shone and so did Henry Marsden – in the first game of the season at Silcoates, he smashed 106 in quick time, to help Hymers to record their first win of the season, in the HMC T20 competition. The next game of T20 was not so successful, with only Marsden (30) making any contribution and so QEGS went through to the area finals as group winners. The following Wednesday, Hymers overwhelmed Huddersfield New College, scoring 248-3 with Angus Brocklesby managing to dodge a fifty, scoring 46. Charlie Rawlins (76no) and Ben Renwick (83no) opened their accounts for the season. Jamie Key took 3-16 in HNC’s reply of 110-9. 39 and 28 from Ben Renwick helping to set the target. Defending an under par score, everything has to go right and so it happened, with tight fielding and inspired bowling from Jason Davies, with 3-10. The game came down to the final ball, with Pocklington requiring a six to win the game. A last-second field change proved the difference, as the ball was smashed to the fielder who had just been moved and would have cleared the rope easily. Well done Captain – Hymers winning by 2 runs. The hospitality at Ampleforth is always first class for the cricket and, after a superb lunch, the home side batted and made 156-6. The Hymers reply started brightly enough, but losing wickets regularly, the total became too much and Hymers fell 32 short, with no one making any real contribution for the school. the First team, plus 3-33, proved too much for QEGS. He was well-supported by Charlie Rawlins with 47, enabling Hymers to reach 243-4. The first of the touring matches was an interesting day, with a teams from Muscat (Oman), coming to enjoy the Hymers hospitality. A four-wicket victory was the result of the first game, Rawlins again being the main run- getter with 54no, but this was more about meeting new people than winning cricket matches. Thanks to all the staff involved in a busy day. as it proved for William Atkinson, taking 6-10 from 8 overs to knock over the St Peter’s top order. St Peter’s managed to recover to set Hymers 187 to win. The Hymers reply was in good shape at 110-2 when rain stopped play, leaving Elstone (38no) and Rawlins (21no) frustrated. Earlier Brocklesby had made 39 to help set up a very likely victory. 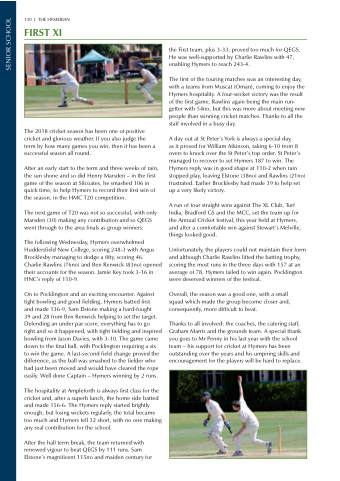 A run of four straight wins against The XL Club, Turf India, Bradford GS and the MCC, set the team up for the Annual Cricket festival, this year held at Hymers, and after a comfortable win against Stewart’s Melville, things looked good. Unfortunately, the players could not maintain their form and although Charlie Rawlins lifted the batting trophy, scoring the most runs in the three days with 157 at an average of 78, Hymers failed to win again. Pocklington were deserved winners of the festival. Overall, the season was a good one, with a small squad which made the group become closer and, consequently, more difficult to beat. Thanks to all involved: the coaches, the catering staff, Graham Marris and the grounds team. A special thank you goes to Mr Penny in his last year with the school team – his support for cricket at Hymers has been outstanding over the years and his umpiring skills and encouragement for the players will be hard to replace.